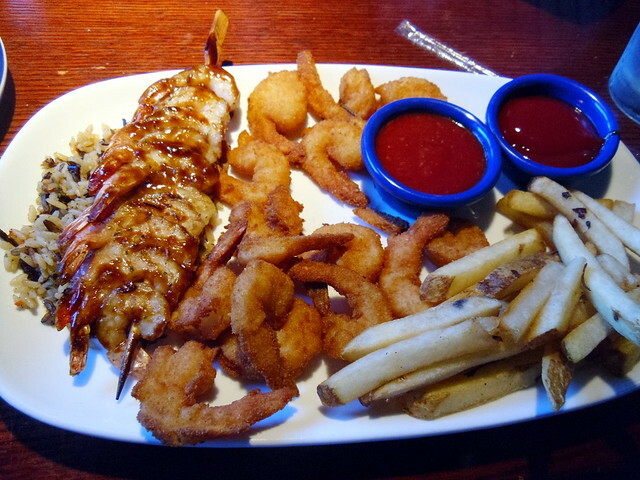 When I lived in Texas, my grandmother would take me to Red Lobster for my birthday. 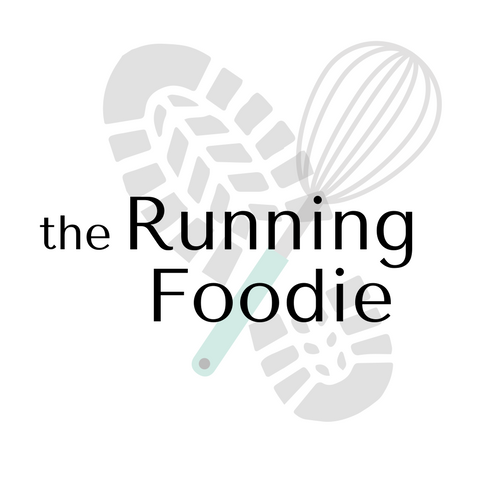 I really loved shrimp (such a refined palate for a young child!) and what better way to indulge my craving than a seafood restaurant? Now, I'm more likely to cook a shrimp dish myself, or eat at a local restaurant. 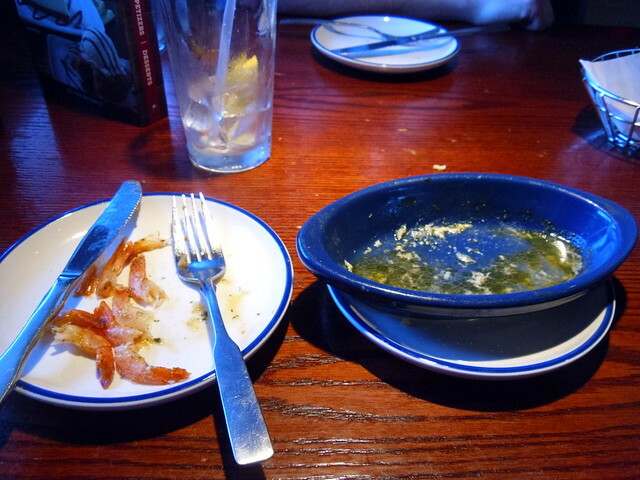 But when Mom Central Consulting gave me the opportunity to experience the 12th anniversary of Endless Shrimp at Red Lobster on their behalf, I took it. 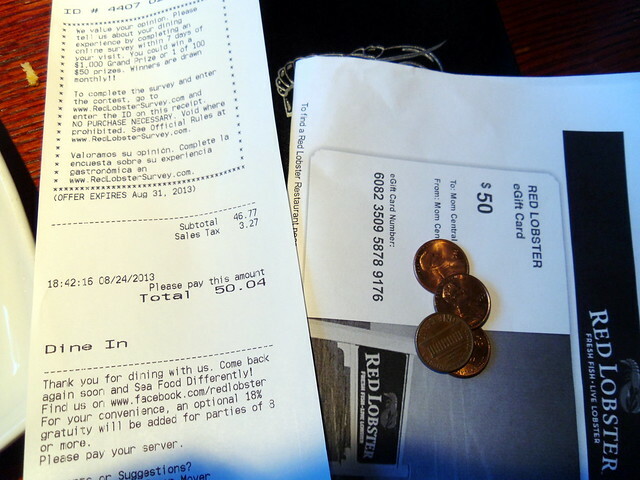 My diner and I headed over to the Red Lobster in Paramus, NJ. We both know that RL isn't a four-star fine dining restaurant, so we weren't going in comparing it to that standard. Since it was for reviewing purposes, my goal was to try all four varieties of shrimp offered in the endless shrimp promotion. 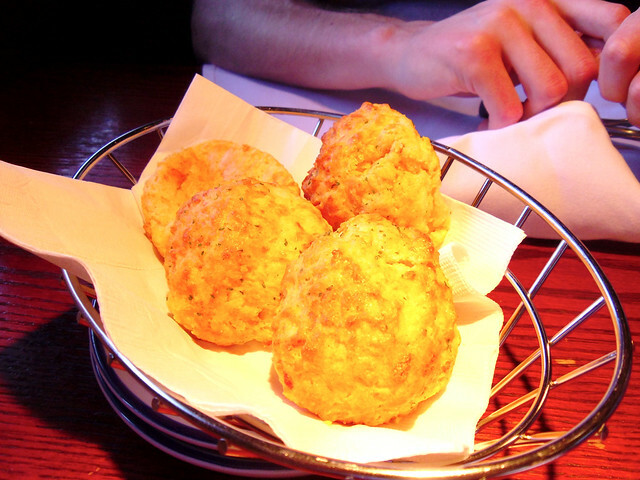 Our meal started with a basket of cheddar biscuits, which, from what I've heard, sound more popular than anything else from Red Lobster. Were these always a part of their menu, or did I just not remember them from so long ago? The biscuits were very light and tender, and also incredibly greasy. I almost ate two before I was warned to stop. Next up was a complimentary salad. For whatever reason, I decided to have it doused in blue cheese dressing instead of a lighter option. There was too much dressing. 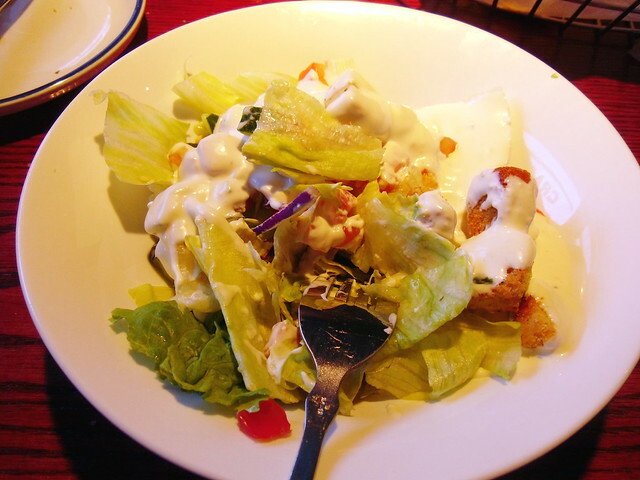 The salad was what I expected for the type of restaurant - iceberg lettuce and boxed croutons, but the additional vegetables were decent and the lettuce was crisp. My diner ordered the Wood-Grilled Lobster, Shrimp, and Scallops. He said it was pretty good based on what he expected. His order came with wild rice pilaf and a side of vegetables. 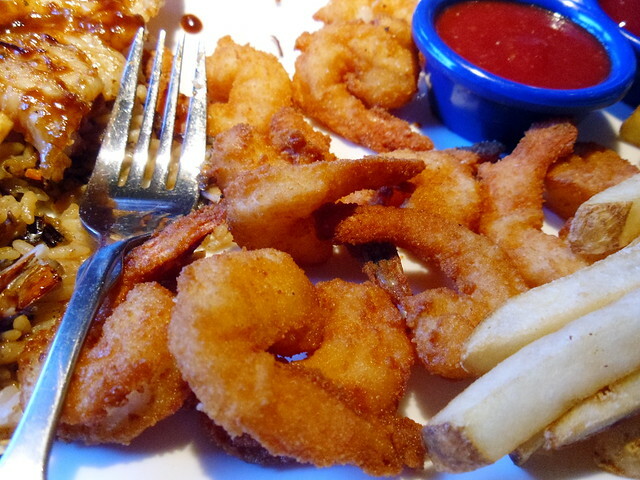 Since I was there to try the Endless Shrimp, that is exactly what I ordered. 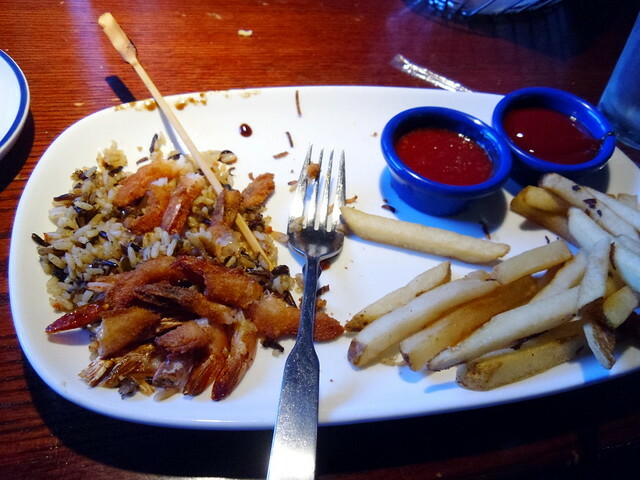 On my first plate was the new Spicy Soy-Wasabi Grilled Shrimp and Hand-Breaded Shrimp along with wild rice pilaf and a side of fries. Okay. To be honest, the spicy shrimp was sweeter than it was spicy, and I couldn't even taste the soy or wasabi, though Alex said he could taste a hint of wasabi (foodie fail). If this shrimp were in a blind taste test, I might have said it was a balsamic glaze, and would have been yelled at by Chef Ramsay. 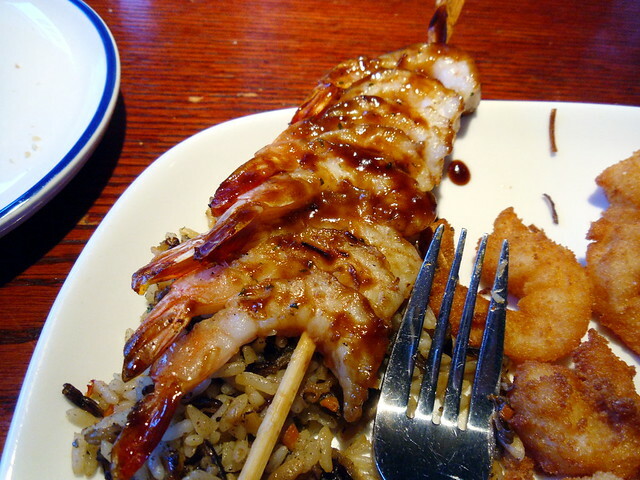 Still, it was much better than the hand-breaded shrimp that wasn't particularly bad or good, just average, and like most fried foods at Red Lobster, greasy. I'd forgo it in the future. I ate most of the shrimp (Alex took a few of each). Next up is my personal favorite, Shrimp Scampi. My mom made this as my birthday dinner for many years. 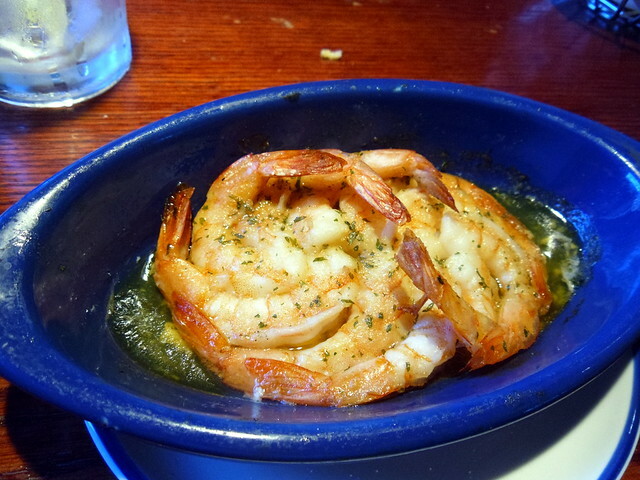 If you can recall the Endless Shrimp from Red Lobster commercials, the scampi is shown served in a white dish, filled to the top. My portion was significantly less than what was shown in those commercials, and I wonder if it would have been bigger had I ordered it first. However, I was happy with the appetizer-sized portion since I still had one dish left to taste. This ended up being my favorite. The sauce was light and not too salty, though obviously greasy since butter is a main ingredient in scampi. The garlic was not very prominent. Not much to complain about here. It was easy to finish the entirety of this dish. The pasta was topped with around 15 baby shrimp. The sauce itself was obviously on the heavy side and I could have done with less of it. It wasn't remarkable, but it wasn't bad. 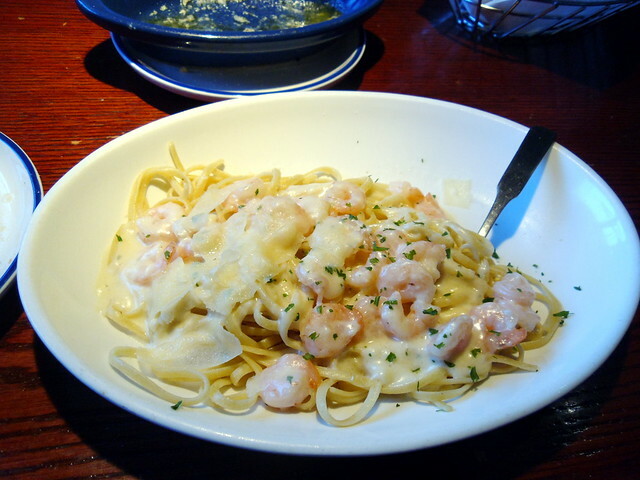 There was just too much pasta for me to take on, even though I managed to eat all of the shrimp. Too.Much.Pasta. I didn't feel bad about wasting it because a) I wasn't expecting a large portion, especially after the size of the scampi, and b) pasta is the cheapest item and the biggest moneymaker for restaurants. 2. Spicy Soy-Wasabi Shrimp, even though it was sweet and not at all spicy, and didn't really taste like wasabi or soy to me. 4. 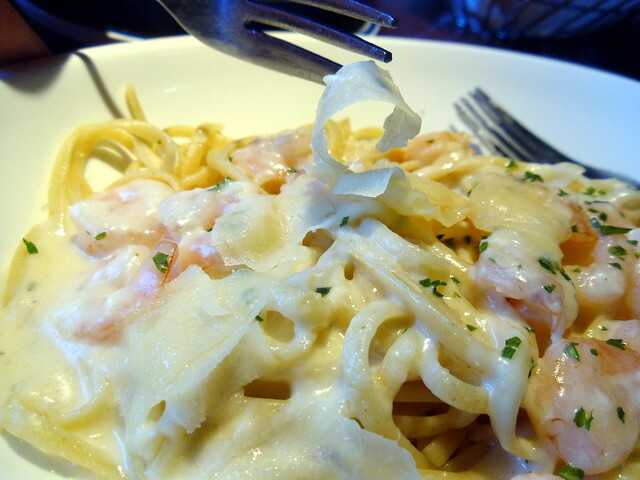 Hand-Breaded Shrimp and Shrimp Linguini Alfredo. I'd skip both of these. For $15.99, endless shrimp might be a deal for you, especially if you stick to your favorite dishes (primarily, #1 and #2), but for someone like me I would be better off ordering an entree-sized portion of a shrimp dish I know I would enjoy. 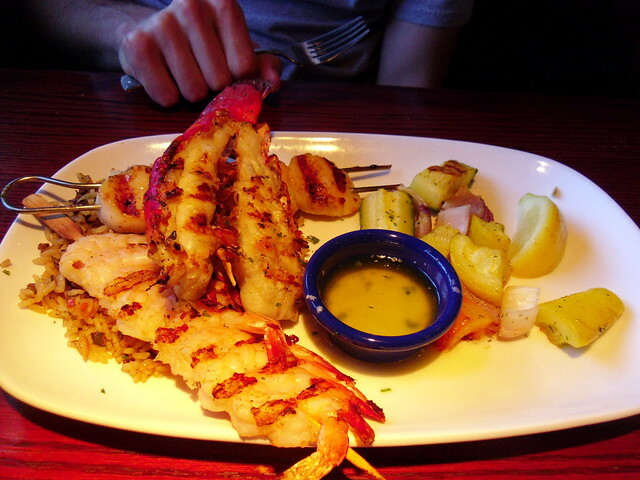 Now for some facts about Red Lobster that I was asked to highlight, such as Red Lobster being the world's largest casual dining seafood restaurant. It makes sense if you think about how busy it always is (yes, I know you can get better seafood elsewhere, but dispense your haughtiness for now). 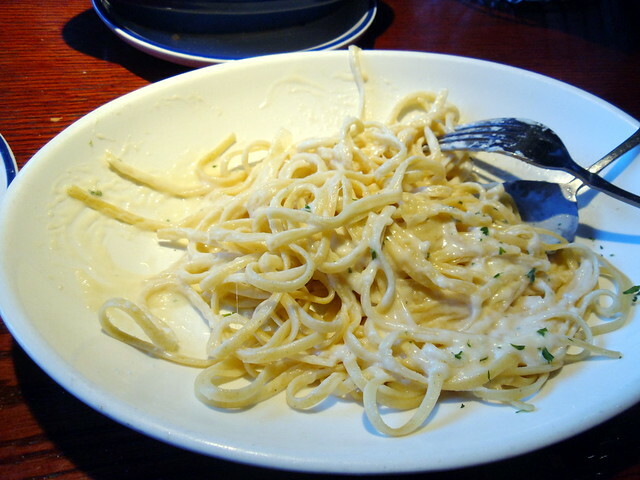 Red Lobster is a division of Darden Restaurants, Inc., which we looked up prior to going (so is Olive Garden, hence why I wondered if they shared the alfredo sauce), as well as finer dining establishments. For three consecutive years, Darden was listed in the FORTUNE "100 Best Companies to Work For" list, and is the only-full service restaurant to be listed. (I was confused if this meant Red Lobster specifically, as I saw this sticker on the door, or if it was about Darden restaurants in general.) Finally, Red Lobster supports the local community by donating more than 60 million pounds of food across the country through the Darden Harvest Program. It may be a chain restaurant, but it's nice to see that they help out. 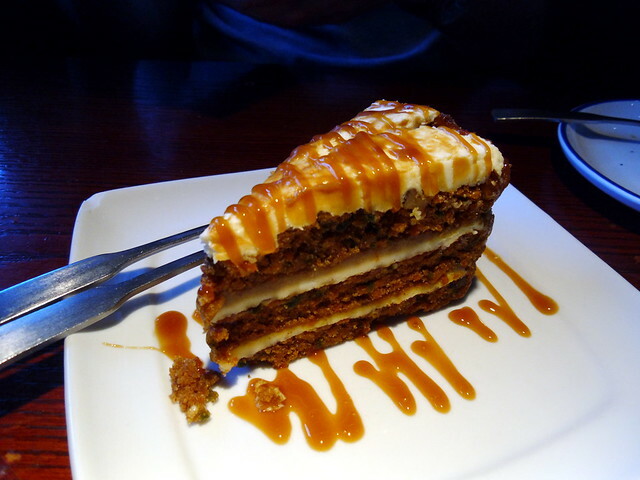 We ended our meal with carrot cake. It was alright, but there wasn't enough frosting. Cream cheese frosting is rather dense, and on an already full stomach (especially after that alfredo sauce), I only managed a few bites. Our total ended up being just over $50. Yes, we tipped. I appreciate your honest review! I haven't been to Red Lobster in so long. I do like those biscuits! I should have asked for more biscuits. Nice! Our server probably would have let us take home biscuits, too, but we didn't think to ask. Don't you feel a little silly spamming a blog, Steve?